Crab Cakes...mmm, they conjure up dinners in the deep south, the deep south of South Carolina. We would travel from coastal town to coastal town, searching out the best crab cakes. Everyone's got a secret, everyone makes them different, but they are all so good. Must be those fabulous blue (or soft ) shell crabs. Oh, the ambiance of the lowcountry; Spanish Moss laden water oaks, the salt water ocean heavy in the air, sea marshes with mile long tides, a moon low in the sky casting silver white shadows over the sand dunes. It's just a feeling, a feeling that's helped along by a long, deep breath, a long slow look, a "put on the breaks and just be" frame of mind. South Carolina, it's a special place. We love crab cakes, can you tell? Serve them on a bed of fresh, crisp summer corn and take a little trip down south. Cut the corn off several ears of fresh summer corn. This is most easily done in a deep bowl with a sharp knife. Do not cut too close to the cob, you only want the tender kernels, not the fibrous cob. Next chop a few green onions, and a bit of red bell pepper. Saute it all quickly (2-3 minutes is plenty) in a skillet over medium high heat in just a knob of butter and a dash of salt. Don't be afraid to judge the amounts yourself, you can't mess this up, I promise. If you only have corn, saute that up and enjoy. It's a great way to enjoy summer corn, much better than boiling. 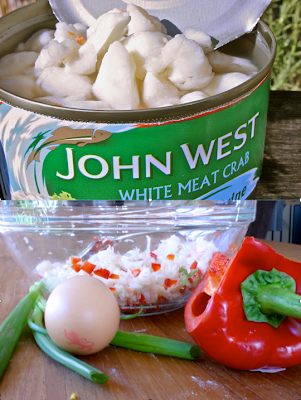 Whisk together the mayonnaise, egg, Worcestershire sauce, lemon juice, green onions, salt and cayenne in a large bowl. Add ½ cup of the breadcrumbs, and stir to combine. Divide the mixture into 6-8 equal portions, forming each into a small cake. Refrigerate for at least 30 minute to set cakes. Dredge the crab cakes in the flour, then dip into the egg wash to coat completely; allow the excess to drip back off. Immediately place in the rest of the breadcrumbs, turning to coat well. Heat medium-size saute pan over medium-high heat. Add the oil and heat through. Carefully add the crab cakes to the hot oil, and cook until golden brown and crusty on the first side, about 3 to 4 minutes. Using a spatula, gently turn the crabcakes over, and cook the other side, about 2 to 3 minutes more. Remove crab cakes and place on paper towels to blot oil. Serve with tartare sauce or chipotle mayonaise, which is a dollop of mayonaise mixed with a bit of chopped chipotle peppers in adobo sauce (available in the USA, but haven't found it in the UK yet).They are also tasty with asian chili sauce. Hey girls! Just managing to catch up with a few FBC peeps and I love these crab cakes and I bet they're amazing with the sweetcorn too. Hi Anne! Actually, the tinned crab meat is wonderful Just make sure to buy a premium(ish) brand, they are better than the store brands. You'll be pleasantly surprised, and the nice thing is you can always have the ingredients on hand and impress those impromptu guests with amazing hors d'ouvres! You do wonders for my love of crab meat. So far the recipe I tried was delicious. This one is next.The corn makes it unresistable. Thanks, Valentina! I love the fact that you can have all the ingredients on hand to make crab cakes whenever you desire! Hope you are having a good summer.